In less than a month I’m going to be reading of an essay at The Lounge theatre in Hollywood as part of a charity benefit my friend Jeff puts together each year. The essay I’m doing is about Buddhism and Spiders, called “Fear and Loathing in the Sacred Circle.” I read a version of it once in Florida at the Warehouse, where it got a pretty good reception, but I felt like it was a little long in places, so I’ve been working to whittle away at it and make it fighting trim. Journalist/playwright/performer Jeff, who hosts the event every year, will do about thirty minutes. I’m excited, because I actually love to read aloud–but I’m also nervous, because I want to do a good job. 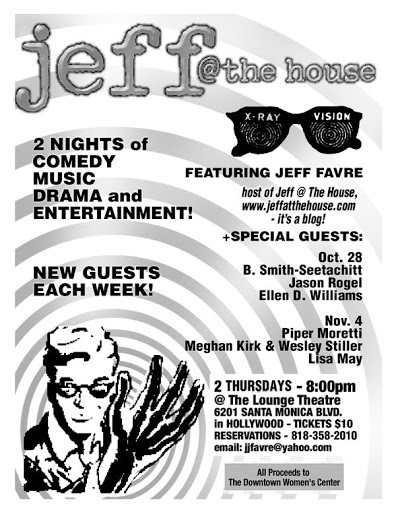 I want Jeff’s show to be a success because of, not in spite of, me. I don’t know what kind of material other people are doing–usually at least one person is pretty funny. My piece has funny parts–but it’s not strictly comedy–so I also have to work at letting it be what it is, and not feel bad if it’s not getting tons of laughs. That is a weird temptation as a performer, to push things for laughs–even though, as an audience member, I don’t really laugh out loud that much–I’m usually quite happy just to be engaged, and when I feel someone “pushing” for my reaction, it can make me a little uncomfortable. Anyway, I’ve been to several of these benefits in the past and –at least from an audience seat, they are always really, fun. Jeff, or friend or family (his dad is a great dessert chef) will make cookies, and he’s a really good host. If you are in the L.A. area, I’d love to see some friends in the audience! The theatre seats 45 people, and apparently both Jason and Ellen have a solid fan base so about 30 seats are filled thus far. Here are details for the performance and how to make reservations. 6201 Santa Monica Blvd, Hollywood. Tickets $10 to benefit the Downtown Women’s Shelter. Previous Previous post: Bigger Better–and Carcinogenic?